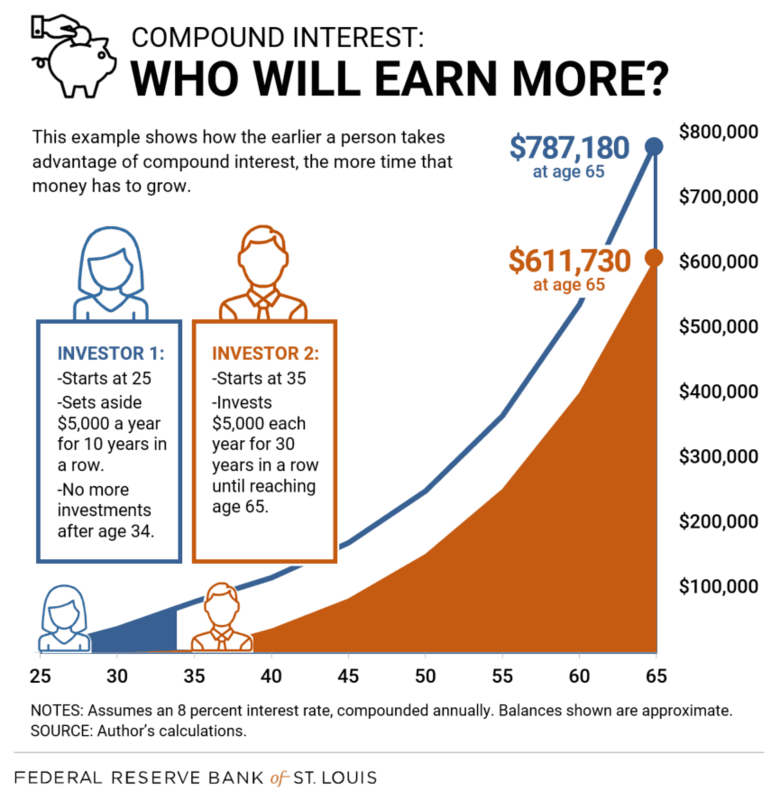 "Compound interest means your money grows at a faster rate because you earn interest on your savings as well as interest on the interest you’ve earned. " Even if you can’t set aside much toward your financial goals, get started immediately. Compound interest means your money grows at a faster rate because you earn interest on your savings as well as interest on the interest you’ve earned. The more frequently the interest compounds (every month versus every quarter, or every day instead of every month), the quicker your balance increases. And the earlier you start, the more time you’ll have for your money to grow. Compounding is amazing for savings—and horrible for debt, since that growth can make it harder to put a dent in your credit card balance as you pay more to the bank. Here’s a classic example of compounding from the Federal Reserve Bank of St. Louis. The saver who starts earlier ends up with a bigger savings balance at age 65, even though her later-starting friend puts aside three times as much money. Those extra 10 years of compounding growth put her ahead. 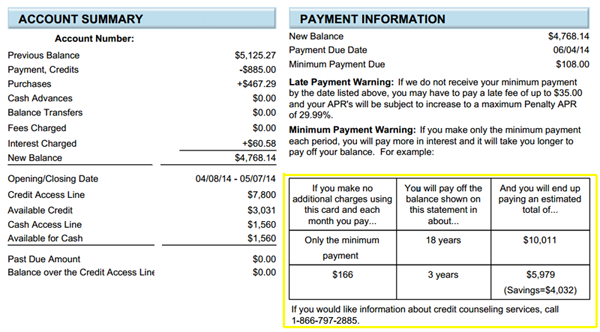 A good illustration of the compounding effect on debt is the “minimum payment warning” you’ll see on your credit card statement, like this example from Credit Sesame. Paying just the monthly minimum on a balance of $4,768.14, in its example, means it’ll take six times as long to zero out the debt. With debt, however, compounding works in the banks’ favor, not yours. If you can’t pay off your balance in full, there are still ways to lessen the impact, says Matt Schulz, chief industry analyst at CompareCards.com. Just keeping on track with the minimum monthly payment helps, he says—banks often calculate that as interest plus 1 percent of the balance. You could also transfer balances to a card with a zero percent offer, to make sure every dollar goes toward the balance. 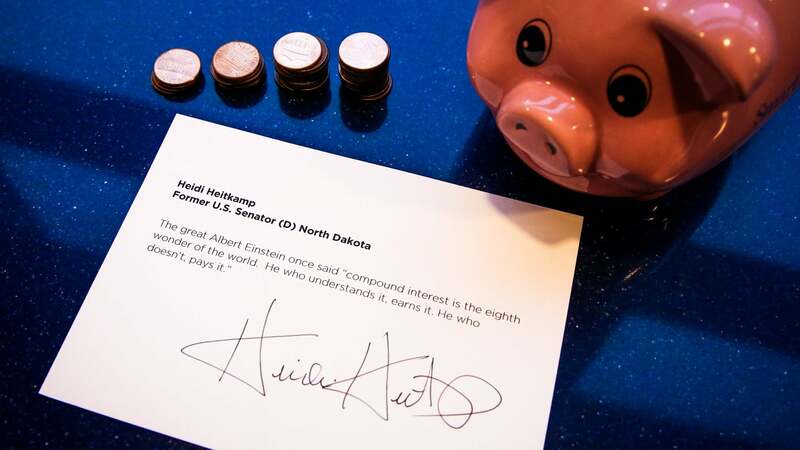 CNBC contributor Heitkamp, who represented North Dakota for six years in the U.S. Senate, credits early financial lessons like the power of compounding for helping her find financial stability. "Start early," Heitkamp tells CNBC. "It is so critically important that we get more people to invest in their future very early on.